Okay, okay, I know I’ve been on a bit of a things-falling-into-black-holes kick. First there was the discussion (found here) of what happens when a non-active massive black hole gets sudden fuel from a star that wanders too close. And then there was the post (found here) about the large gas cloud that’s on track to be tidally disrupted by — and then fall into — Sgr A*, the ~4 million solar-mass black hole at the center of our galaxy. But there’s been a recent press release regarding a paper that discusses Sgr A*’s between-meal munching habits, and I just couldn’t resist. You see, the authors of this paper suggest that Sgr A* is snacking on asteroids and planets. • Title: Sgr A* flares: tidal disruption of asteroids and planets? In the case of a massive black hole that’s not normally active, a tidal disruption event that results from a star that wanders too close can yield a flare that lasts for months and can reach luminosities of 1044–1046 erg/s. These flares are few and far between, however: they are theorized to only happen an average of once per 105 years per galaxy. Given that timescale, it’s no surprise that we’ve never observed a flare of that size from our galaxy’s black hole, Sgr A*. But Sgr A* has its own mystery: it instead displays daily little mini-flares, exhibiting a brightening of 10–100 times that of the quiescent state (to ~1034–1035 erg/s). These unexplained flares last only hours instead of months, and they seem to originate from an area within 10 Schwarzschild radii of Sgr A*. A few possible explanations of these flare have been suggested. These include magnetic reconnection events, turbulent shocks, and jet acceleration. Another possible theory is that each flare results from some transient feature that exists in the accretion flow around Sgr A*, such as an accretion instability, an orbiting hot spot, or a plasma blob. The authors of this paper favor the latter view, with the physical explanation that the plasma blobs originate from infalling asteroids that are tidally disrupted and vaporized. Thus, they argue that the cause of Sgr A*’s frequent flares is sudden small bursts of fuel from asteroids getting a little too close to the black hole. Once establishing this theory, the authors proceed to calculate whether or not it is feasible. They begin by solving for the size of the asteroid necessary to produce the observed flares, based on a moderately efficient mass-to-energy conversion of the asteroid as it is vaporized. The conclusion: an asteroid of roughly 10km in radius is needed; for comparison, our own Oort cloud has many billions of asteroids of this size. The next question is how close an asteroid would have to get to Sgr A* before becoming tidally disrupted, assuming that the asteroid structure is that of many smaller rocks that are gravitationally bound rather than chemically bound. The answer is ~1 Schwarzschild radius, which is consistent with the observed flaring region. 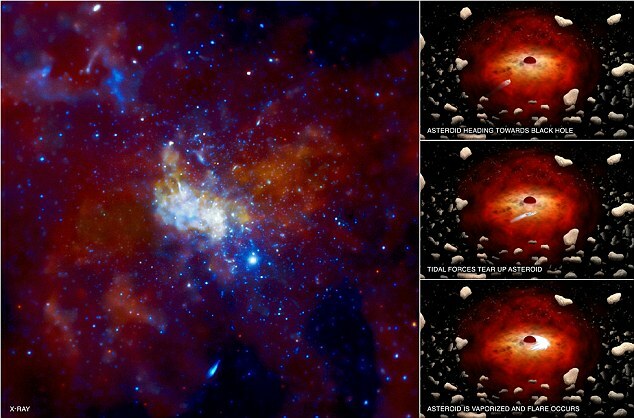 After the asteroid is broken up by tidal forces into pieces smaller than ~1km, the pieces travel very quickly through the accretion flow surrounding the black hole. The aerodynamic friction of this motion turns out to be enough to efficiently vaporize the asteroid pieces. The authors next estimate how frequently such flaring events would occur. This is a slightly touchier calculation, because we are unsure about the asteroid population near the center of our galaxy. It has been proposed that galactic centers are surrounded by a “super-Oort cloud” of asteroids and planets that have been stripped from their parent stars. Making some rough calculations, assuming that the average number per star of asteroids with radii >10km is approximately the same as what we observe for nearby stars, results in a flare frequency roughly on par with what is observed — indicating that this is indeed a feasible theory. The authors extend this theory one level further by pointing out that if stars and asteroids can fall into the central black hole and produce flares of varying sizes, so can planets. They calculate the flare luminosity that would result from a gas giant passing within 1 AU of Sgr A*, becoming tidally disrupted, and accreting onto the black hole. The conclusion they reach — that the resulting flare would have a maximum luminosity of 1041 erg/s, and that there could be brightening relative to the quiescent state for tens of years — is consistent with an event thought to have occurred some ~300 years ago with Sgr A* (which we know about as a result of the X-ray light echo). Based on the calculations in this paper, the hypothesis that Sgr A*’s smaller, frequent flares are caused by tidal disruption and vaporization of a population of asteroids appears to be entirely plausible. The extrapolation of this idea to larger bodies such as planets is consistent with our one observation of a possible larger flare from Sgr A*. At the very least, this theory gives us a lot to keep an eye on in the future. And it’s definitely food for thought.